This interactive course is in movie format. This course will cover myofascial therapy of soft tissue origin of the upper extremity trigger points. Some common cumulative trauma musculoskeletal disorders will be discussed and how to treat through myofascial therapy. 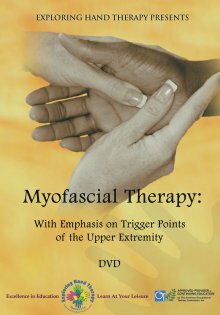 You will view excellent demonstration of trigger point treatment techniques and myofascial therapy of soft tissue origin throughout the course. Instructor takes from pre-trigger point intervention demonstrating low level laser therapy (LLLT) techniques and benefits through post-trigger point exercises. You will also learn about instrument assisted soft tissue mobilization and basic application of the instruments. The instructor will give tips, tricks, and techniques as she takes you from research to clinical application of specific muscle pain pathologies. Excellent introduction to reducing and treating pain associated with CTDs. Manual provided with excellent photos to enhance your learning experience. Note: This course provides conceptual preparation to seek additional training, and does not provide you a mentored hands-on skills session. Please seek additional experience, with a mentor, to perform hands-on skills. Upon Successful completion of the examination (75%) your certificate will be sent via email. I learned what I was hoping to gain from this.